Base Failures can sink a stock that's been trending higher and are an important topping behavior to identify. Please keep in mind, sometimes a base will breakdown and set up again later. This is bound to happen, but I'm going to describe Base Failures that lead to major tops in stocks. A base breakdown occurs when a base (or consolidation) fails before it's able to breakout and assert its leadership. Why is a base breakdown important to identify? A base is a precursor of market leadership. Most durable market uptrends require a steady diet of base breakouts to sustain a meaningful advance. If a base breaks down, it reduces the pool of leadership that's waiting in the wings to fuel a developing advance or reinforce an existing one. 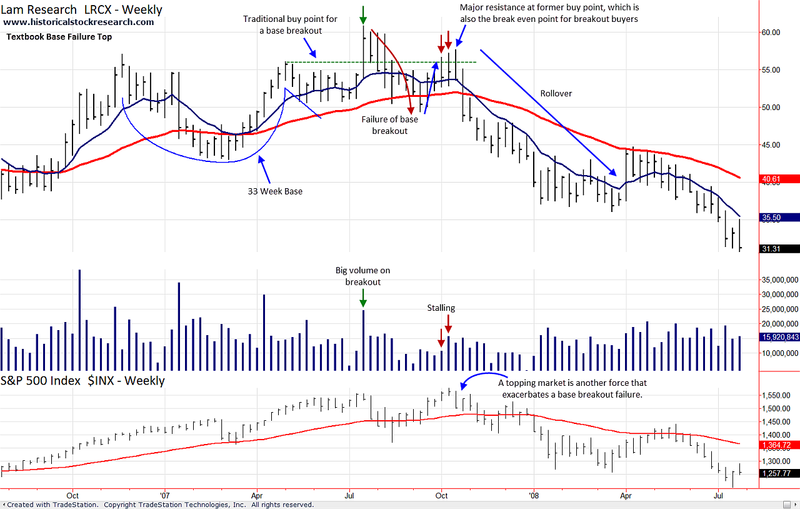 Base breakdowns can be a symptom of a topping market. As an example, the '73-'74 Bear Market was preceded by many stocks breaking down from their basing structures. Whirlpool fell 73% by 1974. A failed base breakout takes place when a stock breaks out of a base and then rolls over into a decline. This is negative because new leadership (base breakout) is not working. When a breakout fails, it tends to put downward pressure on a stock because some investors are forced to sell the stock. However, there may be some recent investors who hold on hoping that the stock will bounce back. If the stock finally does rally, it may fail again near the original breakout level or buy point. This may be caused by the recent investors who decide to sell in order to get out at a break-even price. After price fails again at the original buy or pivot point, a stock's decline can accelerate lower as more investors realize that the stock's in trouble. Lam Research fell 73% by 2008. 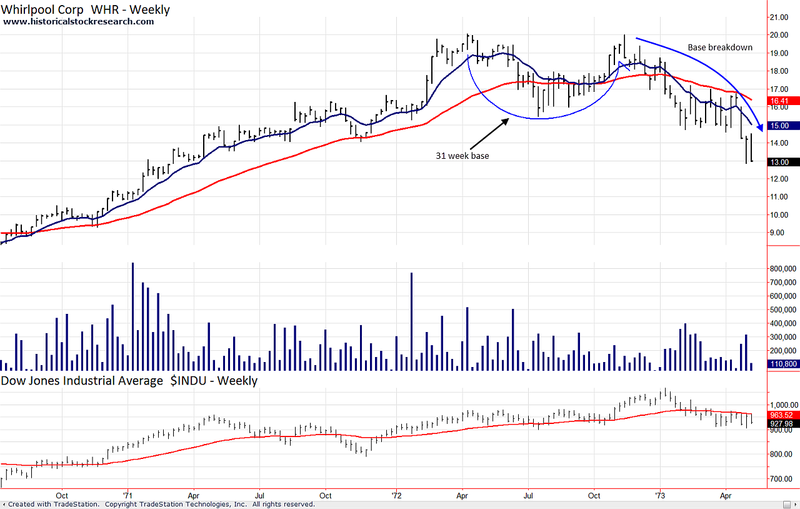 The Lam Research example above is just one way that a base breakout can unravel. A stock has a multi-year advance where price rarely closes below its 40 Week MA. The stock breaks out of a base and fails. Price closes below the 40 Week MA following a failed breakout. Price declines and the stock's advance is over. Note: The close below the 40 Week MA (Step 3) may be the first close below the 40 Week MA in many years. Please >>CLICK HERE<< to go to Monthly Chart Tops.